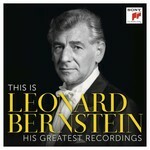 This special edition collects the conductor-composer's 15 most celebrated original albums from the 1950s and 60s on 16 CDs. The best selection of his benchmark recordings as a conductor, composer and pianist including: Stravinsky's Rite of Spring, Mahler's Third Symphony, Beethoven's "Emperor" with Rudolf Serkin, Gershwin's Rhapsody in Blue, Candide and West Side Story among others. The remasterings in this new collection are the best ever issued.of these thrilling recordings by one of the last century's greatest musicians - the perfect introduction to the work of this American genius. Leonard Bernstein (1918-1990) was perhaps the most influential figure in classical music in the last half of the twentieth century. Composer, conductor, author, lecturer and often controversial media personality, the American-born Bernstein had a dramatic impact on the popular audience's acceptance and appreciation of classical music. His own work as a composer, particularly his scores for such Broadway musicals as West Side Story and On the Town, helped forge a new relationship between classical and popular music.